Nan Fairbrother was an English writer who wrote extensively on landscape and land usage. 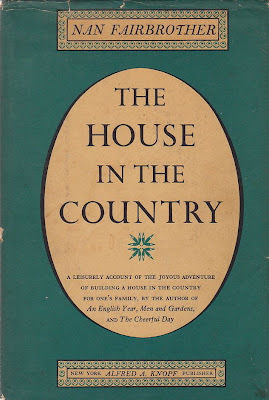 While her most influential book was, New Lives, New Landscapes, which provided a visionary view of the future of land use in England, I think her most poignant book, is The House In The Country. It is a familiar story, after living in London for many years, she and her husband venture out into the countryside to build their dream house. 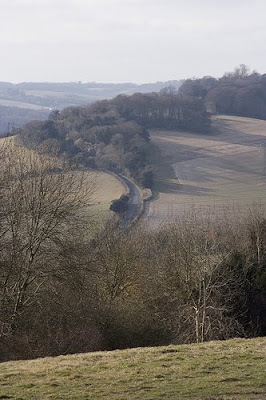 About thirty miles outside of London, she sees the chalky landscape of the Chiltern Hills and she finds her home. The House In The Country details the trials and tribulations of building a house, but it at its best when she talks of building a home and the impact of that home on its surroundings. "This house is much more than the shelter of walls we live in, and built anywhere else than here it would be a different house entirely. For more essential than even its walls is the landscape in the windows, the deliberately imposed consciousness of the countryside it is set in. This house now defines this valley for everyone who comes here, and the landscape radiates from its fixed focus as the world for each of us radiates from our own individual consciousness." Was that picture taken on a recent fly-over of my place?